If you were a carpenter and I were a cloud, what would our chances of true love be? 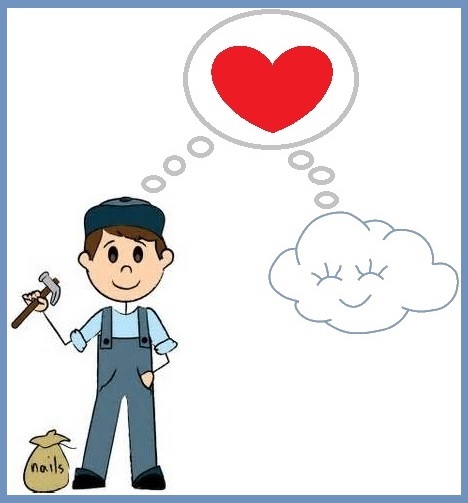 If this carpenter is a concrete person who likes to deal in solid reality—one who doesn’t handle empathy well–and our cloud is an abstract person who wants to ponder what love means, people may not give our relationship much of a chance. What do we have going for us? First, people who are unlike one another may enjoy having a complement, a partner who can be what you cannot. Being opposites doesn’t work for everyone, since OF COURSE you aren’t going to understand where the other person is coming from all the time. The Cloud may interpret subtle meanings for the Carpenter, explaining the kinds of outcomes that are likely in any given situation. For example, I spoke with a young man who didn’t tell his parents when he got married. There was no particular issue at hand; he just didn’t bother. “Why would I?” he asked. “What are they going to do about it?” He couldn’t understand why they were upset. He had no clue why they would need to know. “Why? You couldn’t do anything about it.” Death is more concrete than marriage. He understood the point. The abstract person had translated human behavior into more concrete terms. On the other hand, what does a concrete person have to offer an abstract one? Some concrete people are not distracted from reality by emotion. They can stay focused on the practical goal. They may be good at finances or maintaining an exercise regimen. They often feel overwhelmed or put-off by too much emotional discussion and pressure to care how everyone feels. In the PBS series This Emotional Life, one segment features a young man with Asperger’s Syndrome. He is asked to watch an excerpt of the play Who’s Afraid of Virginia Wolff? The segment shows two couples indulging in emotional carnage as they tear one another apart. When the young man is asked what he noticed in the excerpt, he describes quirks in the light fixture in the room. He is excellent with computers and chess, with following protocols and remembering details—not so good with understanding complex human behavior or even knowing where to look for clues. He’s happy to get a job done without wasting too much time trying to be nice. There are plenty of quizzes available online and elsewhere that promise to tell you what kind of thinking style you have: concrete sequential, concrete random, abstract random, or abstract sequential. They’re fun and do provide a kind of broad spectrum description of the way in which you think. However, their descriptions of what you can do about it are simplistic. They don’t usually pair thinking style with a measure of your capacity for empathy—the combination you have to use to function in a society. Separating thinking from emotion is outdated and poorly informed. Dr. Candace Pert established that we carry the molecules for emotion in every cell of our body. (Some time we’ll explore how what you feel changes what you are—health, longevity, success, etc.) We remember best those details that are associated with an emotion. Most of us don’t belong on one end of the cloud-to-carpenter line or the other. We’re in the middle someplace and have both concrete and abstract moments. How can we discover if a particular relationship problem is due to differences in information processing? One way is to ask questions before you react to what is being said. Repeat the point you think the other person was making back to him or her and ask, “Is that what you mean?” Then be quiet and let the other person explain. If you’re the one doing the talking, ask when you’re done: “What do you think I’m saying?” Phrase it so you don’t sound like you’re questioning the other person’s intelligence or mocking. If you’re like me, you’ll be amazed by the number of times you were certain you knew exactly what was being said, and you were wrong. If you’re the person in the relationship who is better at empathy or putting yourself in someone else’s place, you may need to do the lion’s share of the work in the communication. Women are assumed to be at an advantage when it comes to dealing with communication problems, since in becoming male, a fetus’s brain sacrifices some communication potential for more decision-making, action-taking potential. However, that statement is a generalization, and numerous exceptions abound. If you’re the person who doesn’t really comprehend complex human emotions, then have someone help you formulate a kind of template of acceptable behavior. What do the abstract people expect you to say or avoid saying in a given situation? Dr. Temple Grandin’s mother taught her simple rules of what she was not allowed to do or say in public and enforced those rules, although Dr. Grandin never understood the “why’s.” What does your loved one want you to say? Do you love him or her enough to say it even if it seems silly to you? If you’re the abstract one, prepare to describe exactly what you want—if you really want to receive it. Relationships are always a kind of dance in which two individuals coordinate their movements to avoid causing pain. They enhance the rhythm of connection, shifting as the beat changes, communicating without words those aspects of the relationship that have no words. Their differences create the heat of challenge. I once danced with a young man who went flailing off on his own like a mad construction crane in a Stephen King novel, perhaps trying to impress me with his energy. I wasn’t drawn to him at all. My cloud just drifted away. This entry was posted on January 19, 2014 by Personal Journeys with Gramma in Dear Gramma and tagged Abstract, Communication, Concrete, Concrete Brains, Couples, Dear Gramma, Emotion, Empathy, featured, Feelings, Love, Opposites, Relationships.